In Module 1, you learnt about risk and considered the gains from engaging in risk-taking behaviours in relation to your own life. You also considered what it felt like when you were not supported to undertake activities that were risky. In this module, you will begin to learn about the importance of enabling the people you support to participate in activities involving risk. ​This video is an introduction to this module. Risk enablement, also called positive risk taking, is a way of supporting people with a cognitive impairment such as intellectual disabilities, traumatic brain injury or dementia to participate in activities that involve risk. It is an approach that you can use in your work which helps to maintain peoples’ choice and control over activities. Working with people with disabilities means that you support them to make judgements and you also have to make some of your own in the process. On the one hand, you must respect the preferences of the people you support and their right to make decisions and exercise control over their own lives. On the other hand, you have a duty of care to take reasonable actions to ensure safety and well-being. This does not mean you cannot support people to take risks. It means you need to enable risk taking whilst also respecting preferences and minimising potential harm. How can I support a person with cognitive disability who wants to participate in activities which involve risk, while reducing their potential for harm? Therefore, risk enablement involves you thinking about what the person in a given situation wants. It involves you thinking differently about the support that you provide so that you can respect choices while minimising harm. When enabling risk, it is important to remember that there is a balance between respecting the rights of people with cognitive disabilities and safeguarding their well-being. Achieving this balance can be challenging. People with cognitive disabilities have the same right to take risks as any other member of society but often rely on others to support them to do so. Everybody wants to be sure that the people they support are not harmed. However, when you work in a way that places more importance on protection and control, you become less likely to support risk-taking behaviour and you become ‘risk averse’. What also happens as a result of this pattern of work, is that the dignity, choice and independence of the people you support may be compromised. Figure 2 helps to show this using a graph. Achieving a balance between enabling risk and minimising harm takes time, training, practice and reflection. As a support worker, you have an important role in enabling the people you support to take risks so that they can have new experiences and become more engaged in their day-to-day lives. Supporting positive risk taking means that you support positive benefits like the ones we described in Module 1. Can anyone with a disability be supported to take risks? ​Risk enablement works for everyone. It is about knowing the person and their preferences first. Everyone has preferences although people communicate them in different ways – through words, signs, gestures or actions. Everyone can be supported to take risks. A group of people with intellectual disabilities from the NSW Council for Intellectual Disability (CID) were asked to describe how they felt about being involved in risk-taking activities. If you’re gotta learn, you gotta learn like anyone else. I don’t want royal treatment. We are so focussed on the [support worker] and the parent, we forget about the person. People with intellectual disabilities want to be supported to take risks, do new things, do things they love and show what they can do. The core purpose of your work is to enable the people you work with to do what they want to do. You play a vital role in supporting them to live full lives that reflect their own values and choices. ​What gets in the way of enabling risk for people with cognitive disabilities? Sometimes, there are obstacles – real or perceived – that can get in the way of making risk enablement work. You will come to learn how these might be managed as you work through the later sections of this resource. Let’s think about this scenario. The person you support wants to go for a walk outside on a warm day, but you are concerned they might get sunburnt and you decide you should both go for a drive in the car instead. Can you see how this outcome did not support the person’s choice to go for a walk? In this case, you could have thought about how to minimise harm in a way that you yourself might do it. You might have suggested, for example, wearing a hat, putting on sunscreen, or taking a bottle of water. You could also limit the walk to no more than 30 minutes. This risk can still be enabled and can be done in a way that reduces the risk of sunburn. Core values: These can affect the quality of the support you provide. 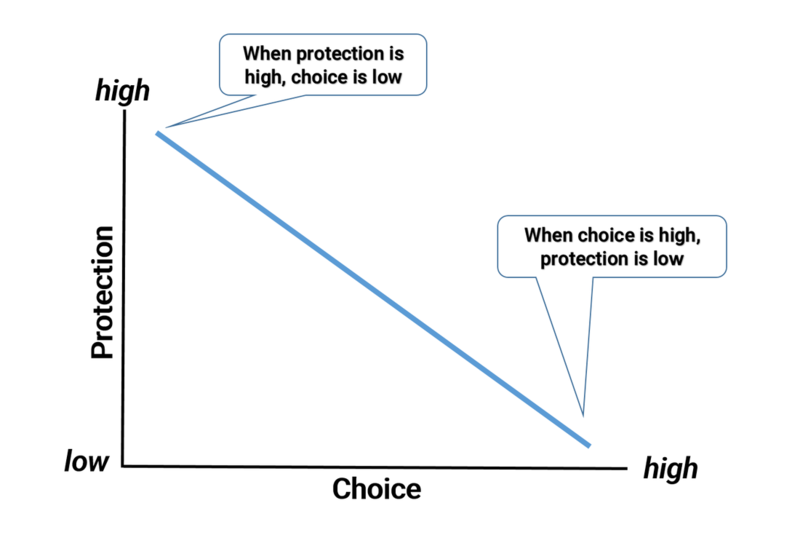 So, if protection is one of your core values, then you might be more likely to make decisions which are suited to you rather than the individual you support. For example, you might do all the cooking for fear of anyone getting burnt from using the hot stove. Remember, risk enablement requires balance. Ways of communicating: One way attitudes are demonstrated in the workplace is through the use of language. Worried something will go wrong: Support workers often express their fear about getting into trouble from their manager or the organisation if the person they support is hurt through an activity involving risk. Working through this online resource will help you to learn how this worry might be managed by exploring the way your organisation supports risk enablement. Lack of training: support workers come from many different educational backgrounds and bring with them life experiences. Learning about techniques to support people with cognitive disabilities, like learning about enabling risk, should be an ongoing part of your working life. Completing training like this is one way forward and will enable you to improve the quality of care you provide. What happens over time when disability support workers try to eliminate risk? Risk can never be fully eliminated because risk also comes from not taking any risks at all. ​A disability support worker who adopts risk averse practice can diminish a person’s self-esteem, confidence and independence. There is also reduced opportunity for people being supported to learn and develop new skills. Unwanted physical and psychosocial outcomes can result. A cycle of dependency is created when a risk averse approach is used. This means that the people you support are forced to rely on the support of others for their basic needs to be met. When a support worker does not enable risk, they actually encourage the person they support to become more dependent on others for help. Wanting to eliminate risk creates an environment where there are no opportunities for people with cognitive disabilities to have a chance to learn from either failure or success and they can therefore become more vulnerable. An example of a cycle of dependency is shown in Figure 3. In this example, John is not enabled to prepare his dinner, nor does he have any choice over how he would like his food prepared. His disability support worker prepares his dinner alone. John is disengaged. Amongst other things, over time this creates a cycle of John being reliant on others for food preparation. Please read the instruction carefully, then complete the table in the downloadable workbook located in the Resources section. Complete the table provided in the workbook by re-writing the missing statements. A completed example is provided for you at the top. Read about Maggie's scenario below, then answer the questions. Maggie enjoys having cups of tea throughout the day. She has limited strength in her arms to lift a heavy kettle. Her disability support worker, Carol, was scalded with boiling water when she was a child and so she is concerned about Maggie burning herself. The kettle is kept in a locked staff office at all times. When Maggie wants a cup of tea, she has to wait for staff to make it for her. Sometimes, staff are busy supporting other residents and so Maggie can be left waiting for some time. Other times, staff forget to bring Maggie her cup of tea. What is considered to be the "risk" for Maggie? List all the things that are 'getting in the way' of enabling Maggie to make a cup of tea. What has happened to the balance of protection and choice in Maggie’s situation? Write all the ways that you think Maggie’s risk can be minimised, so as to enable her to make her cup of tea. Thinking about the work that you do, and the experiences that you have had, can you remember a scenario when a person with cognitive disability was so protected from possible harm that they had little choice? Describe what happened. What did you think about this? ​If you have any questions about this module, or would like some further guidance about the activities, you can send an enquiry using the Contact Form. Suggested responses to the activities are provided in the Resources section. Enabling risk for the people you support is a means to support them living a full and engaged life. Risk can never be fully eliminated for anyone.